I love the way it swirls out from the centre like a kaleidoscope. 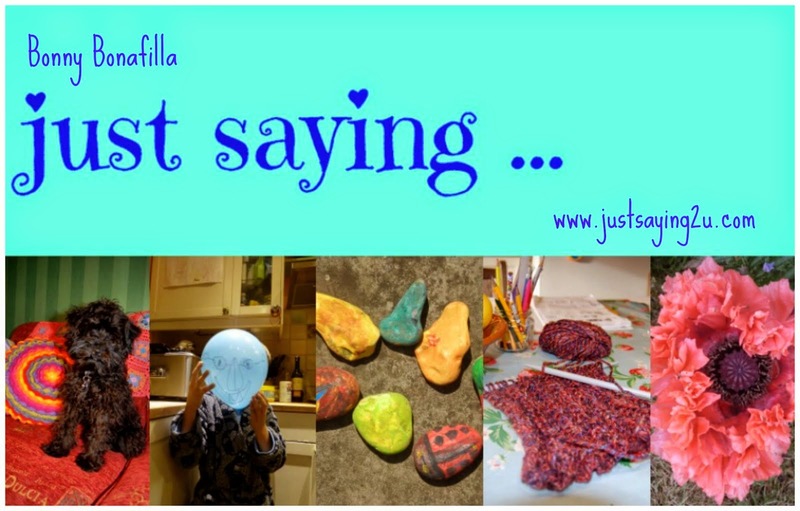 My colours were inspired by the sea, so I thought it only fit to embellish everything using a special bead made out of sea glass, beach-combed from our village beach back on Spain's Costa Brava. 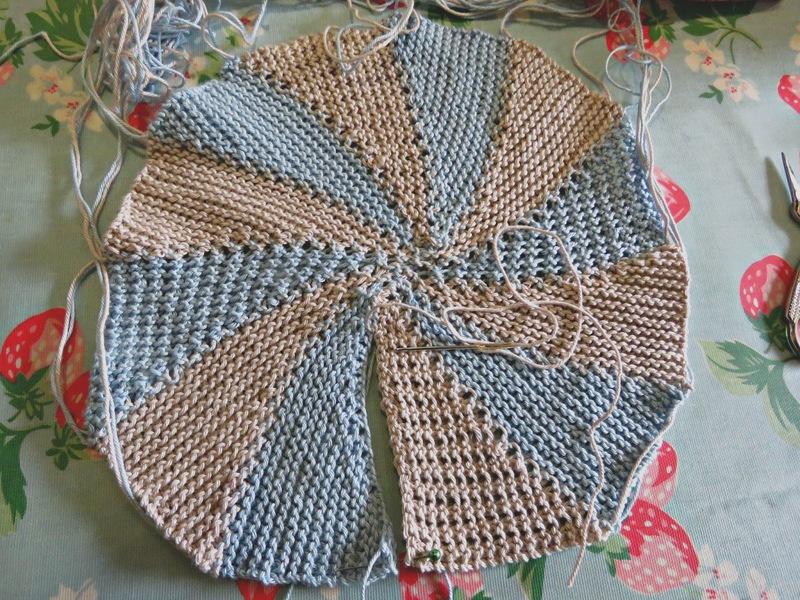 I was aiming for a circle that would be roughly 24/ 25 cm in diameter, but you can make it smaller or larger by simply increasing of decreasing the number of stitches you cast on. 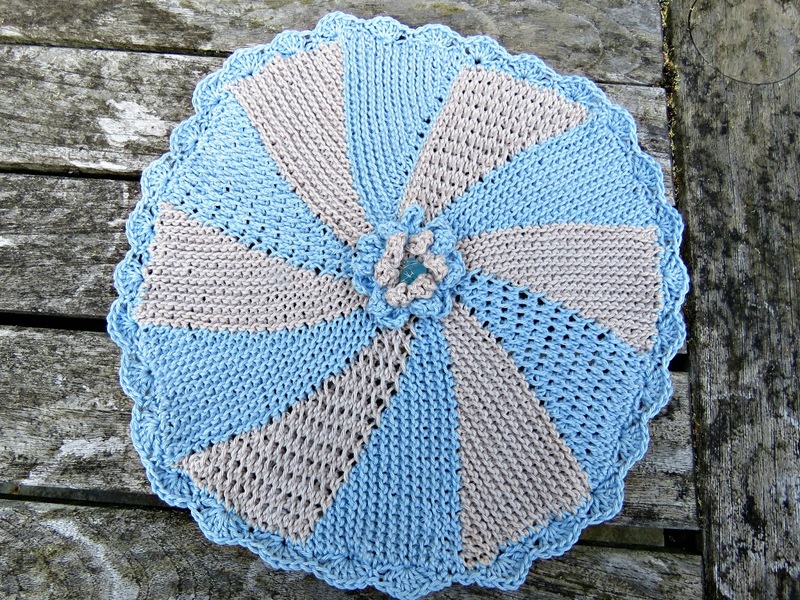 Just remember that for the circle to work you must have an even number of stitches. 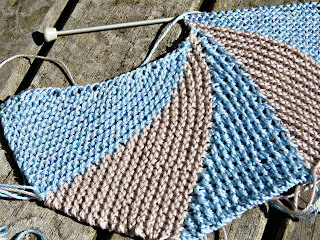 Row 1: Knit 2 stitches and turn. 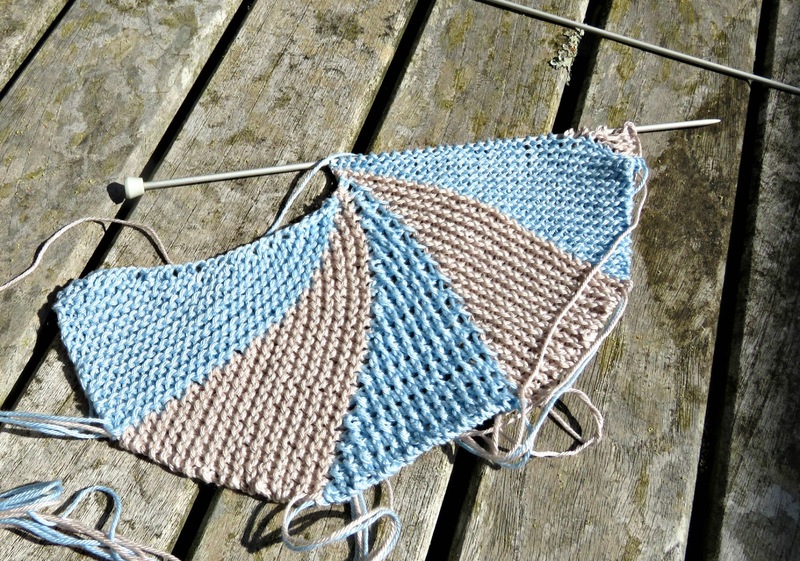 Row 2: Knit those first 2 stitches back to the end again. Row 3: Knit 4 stitches and turn. 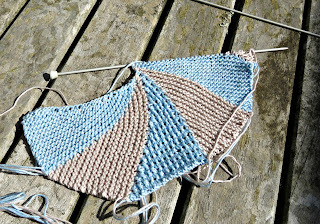 Row 4: Knit 4 stitches back to the end again. 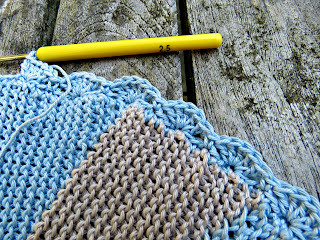 Carry on increasing the length of the row by 2 stitches on each odd numbered row until all of the 30 stitches have been knit, ending with an even numbered row that will take you back out to the circumference of the circle that you're knitting - or the thick end of the wedge that you've just created. 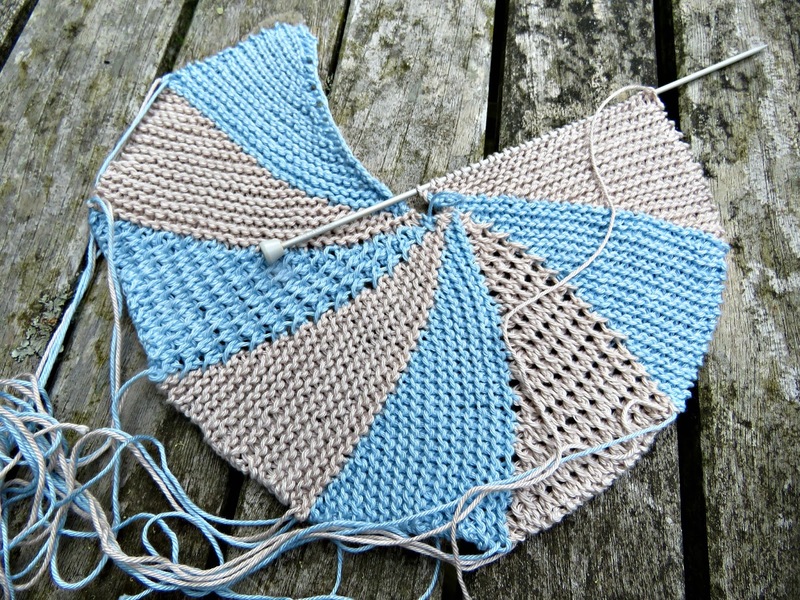 Change colour and repeat the process with the second colour to create a second wedge. 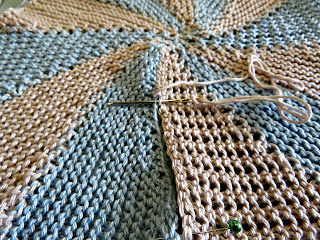 Row 2: Knit 2 stitches back to the end again. Row 4: Knit 1 stitch, wrap the yarn forward around the needle (to create a new stitch), knit 2 together, knit 1 - and you're back out at the circumference again. Row 5: Knit 6 stitches and turn. 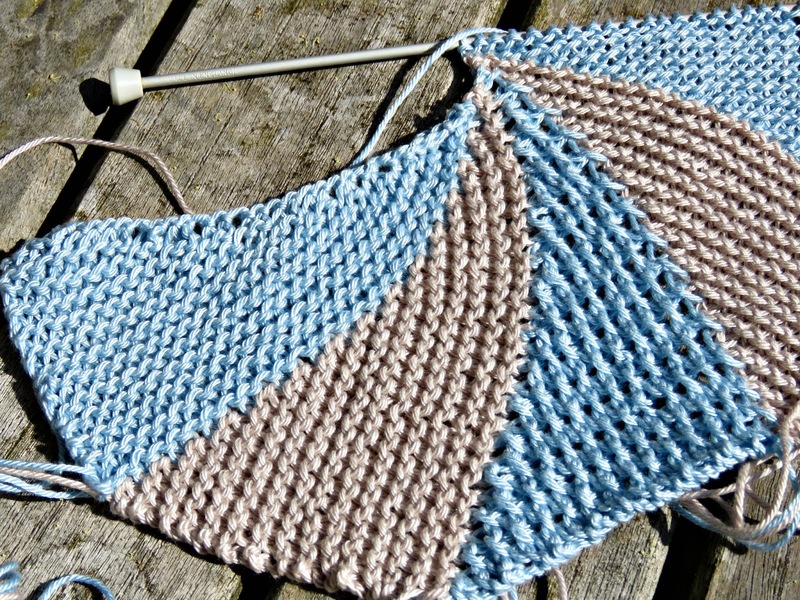 Row 6: Knit 1 stitch, wrap the yarn forward around the needle (to create a new stitch), knit 2 together, wrap the yarn forward (to create another new stitch), knit 2 together, knit 1 - and you're back out at the circumference again. 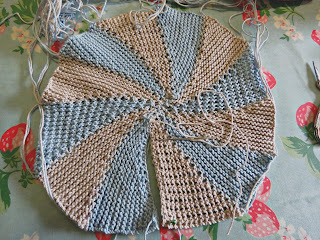 Carry on like this, increasing the length of the row on every odd numbered row until all 30 stitches have been knit, and finish back on the circumference of the circle with an even row. Having completed these 3 wedges you've made a quarter of the circle. Just keep on going, repeating the segments until you've got all the way round. 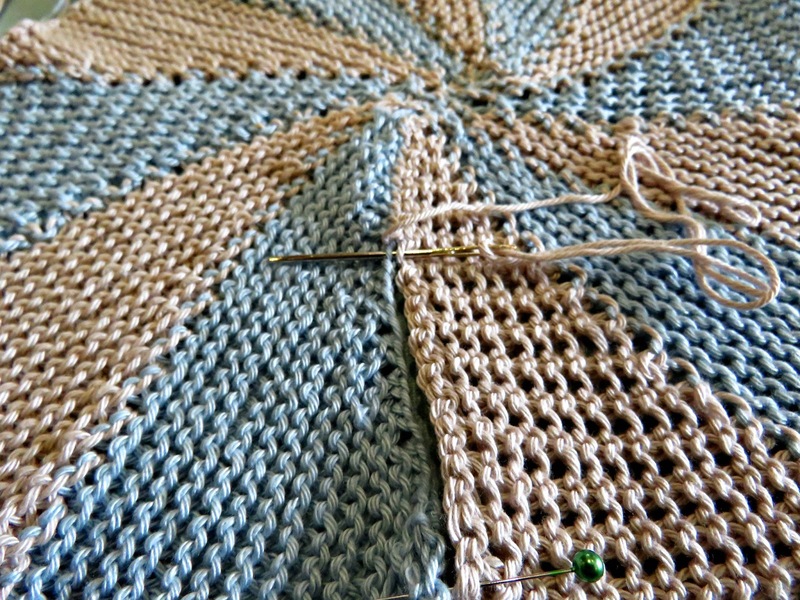 Cast off and darn in the loose ends. Sew the last segment to the first segment. 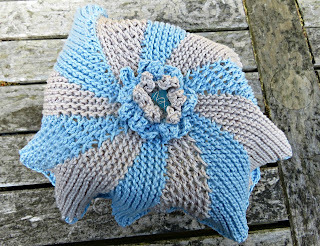 The rose in the centre was made using my sea rose corsage pattern, which you can find here: Sea Rose Corsage. 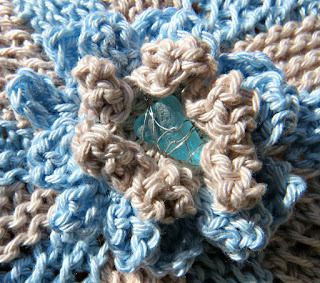 To make the rose a little more like a cabbage rose I added a second round of blue petals in the spaces behind the first set, using the same pattern. 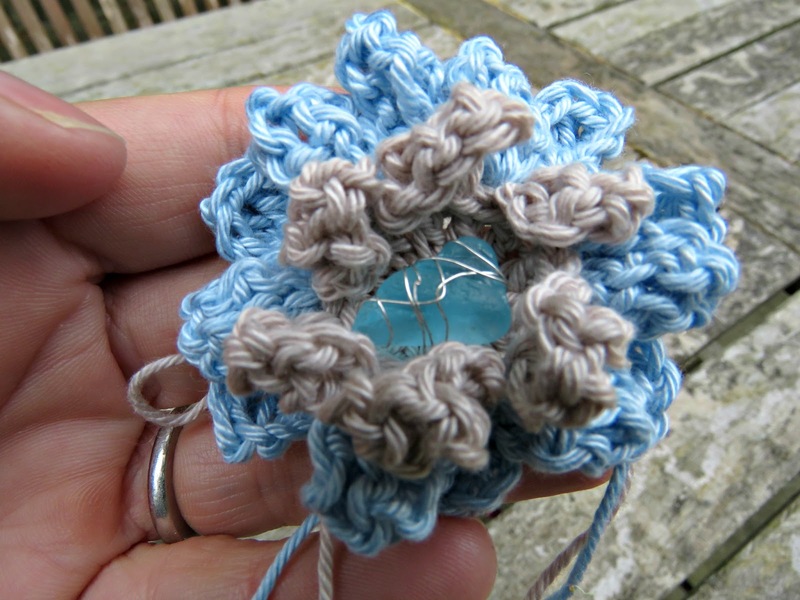 Using a 2.5 mm crochet hook attach the wool that you plan on using for the trim with a slip stitch, and work a foundation row of double crochet all the way around the circumference of the circle. 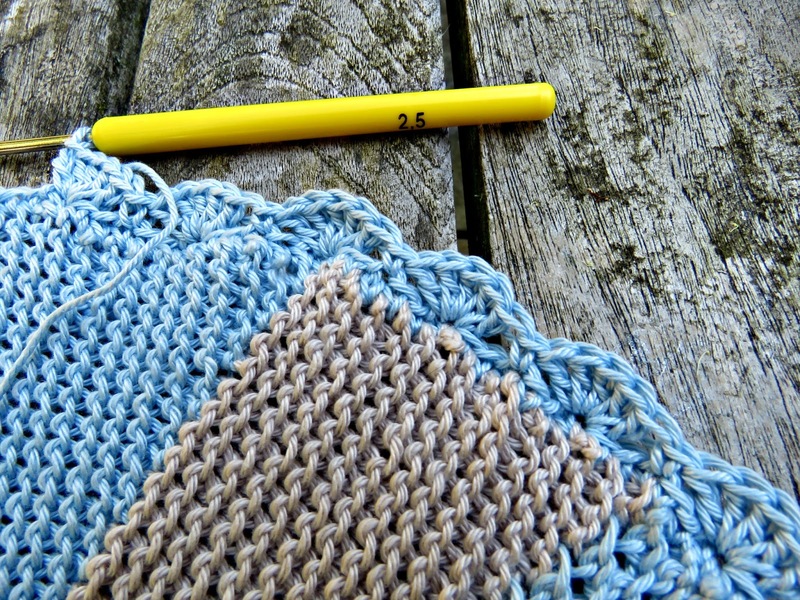 You need to create a total stitch count on this row that is a multiple of 6 stitches plus 1. Chain 1 stitch, and working from left to right along the row work 1 double crochet stitch into the next stitch. 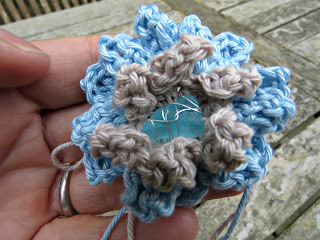 * Skip 2 stitches, work 5 treble crochet stitches into the next stitch along to make the first shell. Skip 2 stitches and make a double crochet stitch into the next stitch along*. 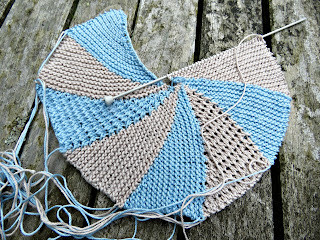 Repeat from * to * all the way round to create the edging. Fasten off with a slip stitch, and darn in the ends. And Ta-dah! 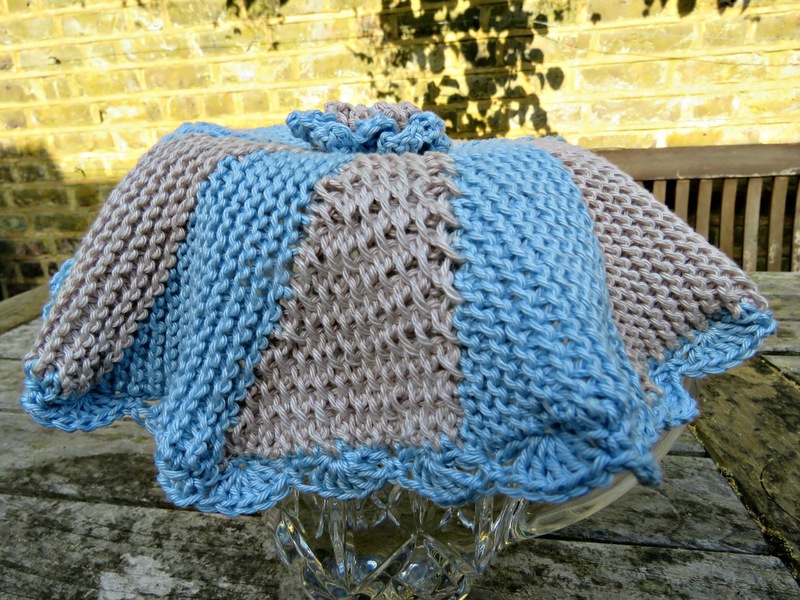 you're done: you've just made another jug cover. 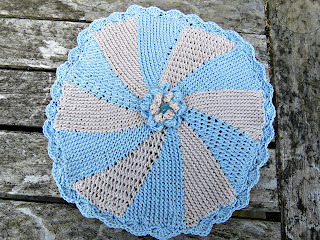 I think this pattern would be great, knit in a different wool, for making a groovy circular cushion - maybe next time!